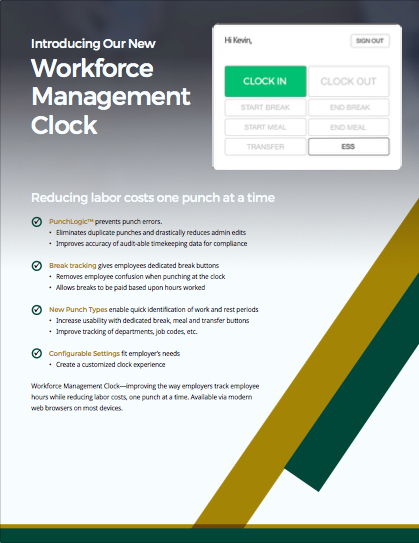 Reduce your labor costs one punch at a time! Access1Source Workforce Management Clock is a new way to improve the way you track employee hours that will save labor costs, reduce employee confusion, and increase your ability to measure your company performance. PunchLogic prevents punch errors, eliminates duplicate punches and drastically reduces the need for admin edits. All this means you can sleep well at night knowing you have accurate, audit-ready timekeeping data that stands up to compliance challenges. Break tracking gives employees dedicated break buttons to reduce employee confusion and increase accuracy. Reducing mistakes keeps payroll within planned boundaries and allows you to control break expenses. Our new punch types allow quick identification of work and break periods. Track dedicated rest, meal and transfer periods for more accurate accounting of breaks, and a more manageable view of your scheduling challenges. Easy-to-configure settings mean you’ll spend less time creating the perfect clocking system for your business. Out-of-the-box settings make setting up easy, and configurable settings allow you to streamline a custom experience for your employees. Download the Workforce Management Clock PDF.